www.t-linespeakers.org/projects/nick/aqa.html (on David Dlugos' "Transmission Line Speaker Page" site, at -- www.t-linespeakers.org), though it is without the design for the electronic crossover-EQ sold with the box. (This last AQA T-line box, with 1" clean-excursion 12" driver and "flame" walnut front [which measured -3db at 23 cps, flat above with the matched crossover] is available for sale for $1200 with the crossover). I used to crack windows with these when testing them at 18 cycles at 150 watts input (but don't tell my landlady in Seattle how those windows got cracked...!;-). 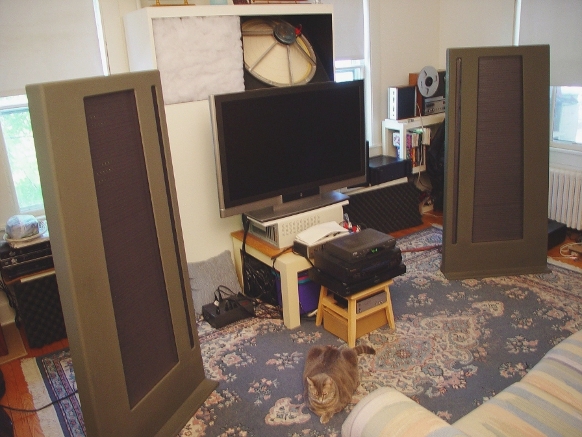 Below are a couple of photos of my current Audio-Video setup (with cat...;-). Behind the left speaker above, you can see part of my last Aardvark Quark subwoofer, and behind the right Apogee panel in the photos above you can see my old Revox and DBX recording combination which I used to record concerts in Seattle (using the simple mic preamp I designed, and omni mics made from $1.50 Panasonic modules mounted in brass tubes in triples - which sounded remarkably good!). Perhaps sometime I will get around to transferring the most interesting recordings to CD (I have some wonderful theater organ recordings, a recording of some pieces by Alan Hovhaness with AH playing and his wife singing, many recordings of reproducing pianos playing rolls made by long-dead composers and pianists on recording pianos, a recording of a Satie mass, and much more...).